Profile America -- Friday, July 1st. "America runs on Bulova time." That declaration was the entire audio portion of the first advertisement appearing on a commercial television station. The rather subdued ad was broadcast on New York station WBNT on this date in 1941, the first TV ad with the sanction of the Federal Communications Commission. The 10-second spot appeared in a Brooklyn Dodgers game against the Philadelphia Phillies. Consisting of nothing more than the image of a ticking clock, the ad cost Bulova just $9. TV commercials have grown vastly more sophisticated since the 1941 experiment. Creating new commercials contributes to the $60 billion in annual revenue earned by the nation's 14,000 video and motion picture production outlets. You can find more facts about America from the U.S. Census Bureau online at www.census.gov. SANTA MONICA, Calif., June 30, 2016 /PRNewswire/ -- Kin Community, the premier home-focused content brand and creator community, announced today that it has raised $13.5 million in new funding through a Series D financing round led by Emil Capital Partners, a consumer focused investment firm backed by retail giant Tengelmann Group, with participation by Corus Entertainment (Canada), Allure Media (Australia) and TEGNA (US). -- Invest in global sales, marketing and partner management infrastructure. Kin Community has over 170 million followers across social platforms and generates more than 600 million video views monthly. Its creator community includes some of social media's most well-known lifestyle names - Rosanna Pansino (Nerdy Nummies), Hannah Hart (MyHarto), Jenn Im (Clothes Encounters), Lauren Riihimaki (LaurDIY) and Rachel and Byron Talbott. At its NewFront in May, Kin Community re-positioned its consumer brand around home-focused video content with the mission of helping millennial women around the world "make their way home." "There are over 800 million young women around the world on a journey to define home for themselves," said Kin Community Co-Founder and CEO Michael Wayne. "With our new partners and funding, we will further our mission to inspire and inform this generation through our extraordinary content and creator community." New food, home and DIY social programming across YouTube, Facebook, Instagram, Twitter and Snapchat, coupled with new distribution partners Amazon, Roku and AppleTV, will enable Kin to inspire and inform young women wherever they are consuming content. As part of the new funding, Kin and TEGNA, a digital and media company comprised of 46 television stations, Cars.com, CareerBuilder and other businesses, will work together to explore potential opportunities for content sharing, sponsored content and cross-promotion. Through this partnership, TEGNA and Kin's brand, content and creator community will connect with new audiences in fresh and exciting ways. In addition, Kin will work with its outstanding creator community to produce groundbreaking new and returning video series. Series include Overhaul, a home makeover-meets-ecommerce experience with Christiane Lemieux; Dinner Exchange, a global food culture sharing series; and Aging Out, a docu-series about young women leaving the foster-care system and moving into their first homes. Kin Community will continue expanding its global presence. Kin Canada, which opened for business in 2014 in partnership with Corus Entertainment, has experienced tremendous growth in its first 18 months. Headquartered in Toronto, Kin Canada has been responsible for adding fast-growing creators like Yolanda Gampp (How To Cake It), Rachel Cooper (Rachhloves) and Lauren Toyota (Hot For Food). It has secured dozens of brand partnerships with notable advertisers, including Motrin, McCain, Baskin Robbins and Banana Boat. This Fall, Kin Community will launch Kin ANZ in Australia and New Zealand in partnership with Allure Media. Kin will foster and support new relationships with lifestyle content creators and bring high quality brand content and marketing solutions to leading advertisers in the Australian and New Zealand market. Kin continues to gain momentum in the US with world-class advertisers including Olay, Nordstrom Rack, Chevrolet and Target. With growing offices in New York, Chicago, Los Angeles, Toronto and Sydney, Kin will invest in more sales, marketing and partner management infrastructure to meet global advertiser demand and provide more opportunities for its brand and creator community. Founded in 2007, Kin Community is a digital media company that inspires and informs young women around the world through home-focused content and community. Kin Studios produces world-class video content in categories that include food, home, and DIY. The Kin Community multi-platform network is home to more than 120 of the best lifestyle content creators from all social platforms. It has more than 170 million social followers while delivering over 600 million video views every month. Kin Community's investors include Mayfield, General Catalyst, Rustic Canyon, Atomico, Corus Entertainment, Emil Capital, Allure Media and TEGNA. Madame Tussauds New York Opens Highly Anticipated "Ghostbusters Experience" And World's First Hyper-Reality Experience "Ghostbusters: Dimension"
NEW YORK, June 30, 2016 /PRNewswire/ -- July 1(st) marks the official opening of the all new Ghostbusters Experience exclusively at Madame Tussauds New York, made possible through a collaboration with Sony Pictures, Ghost Corps and THE VOID. Created in advance of the highly anticipated movie Ghostbusters, in theaters July 15, the new experience is a fully immersive, authentic and multi-sensory space where guests are not only able to interact with Madame Tussauds' newest figures, but also enter an authentic physical environment that brings the Ghostbusters story to life with an epic Hyper-Reality finale. The opening of Ghostbusters Experience marks the next step in an evolution for Madame Tussauds as the attraction launches into a new era of completely immersive entertainment offerings for visitors. Guests will walk through multiple scenes from the new film and then can become actual ghostbusters themselves as they grab proton packs and blast their way through an incredible Hyper-Reality experience, Ghostbusters: Dimension. Designed and created by tech innovators, THE VOID, Ghostbusters: Dimension combines interactive physical environments, real-time effects, and virtual reality to allow guests to step into the movie in a way not even the actors have done. "This is unchartered territory for Madame Tussauds New York and we are excited to bring this iconic franchise to life for Ghostbusters fans far and wide," said Eric Fluet, Head of Marketing and Sales at Madame Tussauds New York. "With the help of Sony Pictures and THE VOID, we are elevating the Madame Tussauds brand to offer not only the amazing figures that we are known for, but a fully immersive experience that will bring the figures and the film to life." "The experience at Madame Tussauds New York, combined with Ghostbusters: Dimension from THE VOID, makes this an exciting Ghostbusters destination in Times Square," said Mark Caplan, Senior Vice President, Sony Pictures Consumer Products. "It's not only a great way to get excited about the new movie, but a fun way to get your ghost on in New York." "Ghostbusters is an amazing property that has kept fans enthralled for decades, and Madame Tussauds is the perfect one-of-a-kind location. This Hyper Reality (HYPR REALITY) experience will have people talking for years to come. It brings Ghostbusters to life in a way that no one has ever experienced before," said Ken Bretschneider, Chief Executive Officer and Co-Founder at THE VOID. through the windows of an oncoming subway car. moving rocking chairs amplify the unknown presence. actual props from the movie. Moving on from the Ghostbusters Experience, guests can ride off in victory on a replica of the Ecto-2 motorcycle complete with a green screen photo opportunity. Now that they have become Ghostbusters and are feeling fearless, guests will also have the opportunity to upgrade their visit to include Ghostbusters: Dimension, the world's first ever Hyper-Reality experience. Ghostbusters: Dimension, which will be available exclusively at Madame Tussauds New York, utilizes THE VOID's proprietary hardware and software to allow guests to step beyond reality and into the world of the Ghostbusters. Offered as an additional experience, teams of three will grab proton packs and suit up for their very own ghost-busting quest, trapping and blasting their way through a New York City apartment. Ghostbusters makes its long-awaited return, rebooted with a cast of hilarious new characters. Thirty years after the beloved original franchise took the world by storm, director Paul Feig brings his fresh take to the supernatural comedy, joined by some of the funniest actors working today - Melissa McCarthy, Kristen Wiig, Kate McKinnon, Leslie Jones, and Chris Hemsworth. This summer, they're here to save the world! The film is produced by Ivan Reitman and Amy Pascal, and written by Katie Dippold & Paul Feig, based on the 1984 film "Ghostbusters," an Ivan Reitman film, written by Dan Aykroyd and Harold Ramis. The film will be released in theaters nationwide on July 15, 2016. Madame Tussauds New York, prominently located in the heart of Times Square, is more than just a wax museum; it is an iconic "must do" New York experience and home of the Ghostbusters Experience and Ghostbusters: Dimension Hyper-Reality Experience. There are no velvet ropes or obtrusive barriers to keep guests from interacting with over 200 of the world's most recognizable and influential icons. The fully immersive, one-of-a-kind attraction is great for families and visitors of any age. With particular dedication to regional visitors, local admissions offers are available. Visit www.madametussauds.com/newyork or call (866) 841-3505 for more information. MERLIN ENTERTAINMENTS plc is the leading name in location-based, family entertainment. Europe's Number 1 and the world's second-largest visitor attraction operator, Merlin now operates 112 attractions, 12 hotels/4 holiday villages in 23 countries and across 4 continents. The company aims to deliver memorable and rewarding experiences to its almost 63 million visitors worldwide, through its iconic global and local brands, and the commitment and passion of its managers and 26,000 employees. THE VOID is leading the world in a new form of immersive entertainment. A combination of a physical set, real-time interactive effects, and virtual reality are utilized to create Hyper-Reality experiences, that meld the digital and physical worlds together, allowing guests to step beyond reality and into their favorite movies and video games. For more information, visit: www.thevoid.com or email press@thevoid.com. SHANGHAI, June 30, 2016 /PRNewswire/ -- On June 3(rd), the Online Interactive Entertainment Market Talk Show Studio co-founded by 37Games and Yangcheng Evening News broadcast its first show. The studio is to provide a communication platform within the interactive entertainment industry and bridge the gap between the industry and consumers, inviting experts, scholars and experienced practitioners to the talk show to discuss diverse topics related to entertainment. The studio is a joint effort of the two companies to stimulate the development of the entertainment industry in an innovative way. Each one-minute video is available in English, Spanish, Mandarin, and Bengali. NEW YORK, June 30, 2016 /PRNewswire-USNewswire/ -- WNET, America's flagship PBS station, is adding two new videos to its well-received roster of eight one-minute pieces entitled New York Parenting Minutes. The new videos, produced for wide digital and social media distribution to parents and caregivers across the city, focus on simple strategies for strengthening early math skills and providing healthy snacks. The two new videos are scheduled to go live this evening by 6 p.m. ET. Created to promote early childhood learning and positive parenting skills, the collection provides important information about raising young children in an educational and healthy home. Each video page contains links to relevant NYC resources, as well as "Tips & Facts" to help parents implement the video's themes. Like the earlier videos, the two new parenting minutes were developed with input from partners in the NYC Early Learning Network (NYC ELN). The NYC ELN includes approximately 30 representatives from early learning organizations across the city, including museums, libraries, city agencies, and WNET, all of whom work collaboratively to support parents, caregivers, service providers, and advocates. *The two new videos are scheduled to go live this evening by 6 p.m. ET. The videos are available for viewing on the WNET Education website. WNET New York Parenting Minutes are presented as part of The American Graduate: Let's Make it Happen Initiative, a major national effort generously supported by the Corporation for Public Broadcasting, promoting collaboration between public media stations and community partners to help keep students on the path to graduation, successful careers, and lifelong learning. The New York Parenting Minutes have also been funded, in part, by the Helena Rubinstein Foundation. ATLANTA, June 30, 2016 /PRNewswire/ -- Bounce TV, the nation's fastest-growing broadcast television network designed for African-American audiences and the only emerging network producing original scripted series, will premiere an all-new second season of its popular situation comedy In The Cut on Tuesday, July 5(th) at 9:00 pm/ET, 8:00 pm/CT. Coming off of its highly-rated inaugural season, this acclaimed show stars Dorien Wilson (The Parkers, Dream On), Ken Lawson (The Parkers), John Marshall Jones (The Smart Guy) with Kellita Smith (The Bernie Mac Show, The First Family) joining the cast this season. Large and in charge Jay Weaver (Wilson) is an accomplished entrepreneur and barbershop owner. Jay's life as a San Diego bachelor is abruptly disrupted when he meets Kenny Clark (Lawson), who turns out to be his 31-year-old illegitimate son from a short-lived fling. Kenny wants to get in on the family business and as these two attempt to get to know one another and build their relationship, Jay experiences a range of hilarious setbacks while trying to keep up with Kenny's life. The new season of In The Cut will follow this father-son duo as they join in on a secret jailbreak, barbershop pranks and Jay's growing attraction to Cheryl (Smith), the new co-owner of the beauty salon next store. New episodes of In The Cut will premiere Tuesday nights at 9:00 pm/ET, 8:00 pm/CT starting July 5 on Bounce TV. NEW YORK, June 30, 2016 /PRNewswire/ -- An Interview with God, a provocative mystery-drama starring Oscar® nominee David Strathairn (Good Night, and Good Luck, The Bourne Ultimatum, Lincoln) and Brenton Thwaites (Maleficent, The Giver, Pirates of the Caribbean: Dead Men Tell No Tales), completed principal photography today following a four-week shoot on location in Brooklyn, Queens and Manhattan, it was announced by Giving Films, the charity independent film label. Directed by Perry Lang (Men of War, Weeds) from a screenplay by Ken Aguado, the cast also includes Yael Grobglas (Jane The Virgin), Hill Harper (Concussion, CSI: NY) and Charlbi Dean Kriek (The Other). Aguado and Fred Bernstein are producing with Richard L. Jackson, founder of Giving Films, and Paul Kurta serving as executive producers. An Interview with God is a mystery-drama set in New York City. Paul Asher, an up-and-coming journalist, finds his life and faith increasingly challenged when he's granted the interview of a lifetime - with a man who claims to be God. Brenton Thwaites portrays Asher and Strathairn is The Man. "The film unfolds as a mystery, with many surprising twists and turns. We wanted to make an accessible film that explored core aspects of faith and inspiration, but one that would also stand on its own as great entertainment," said Aguado. Bernstein noted: "Through a provocative story, An Interview with God poses a simple yet profound question to the audience: If you could interview God, what would you ask?" "Giving Films is committed to presenting quality films and funneling 100 percent of its profits to charities making a difference in the world. We believe that An Interview with God will entertain and inspire audiences, while also serving our mission," added Jackson. Giving Films is a non-profit label committed to films that entertain and spark conversations around life, faith, and relationships. One hundred percent of Giving Films' profits from An Interview with God will be donated to organizations supporting foster care, mental health services, and veterans. The company's first film, the 2015 release 90 Minutes in Heaven, starred Kate Bosworth and Hayden Christensen. 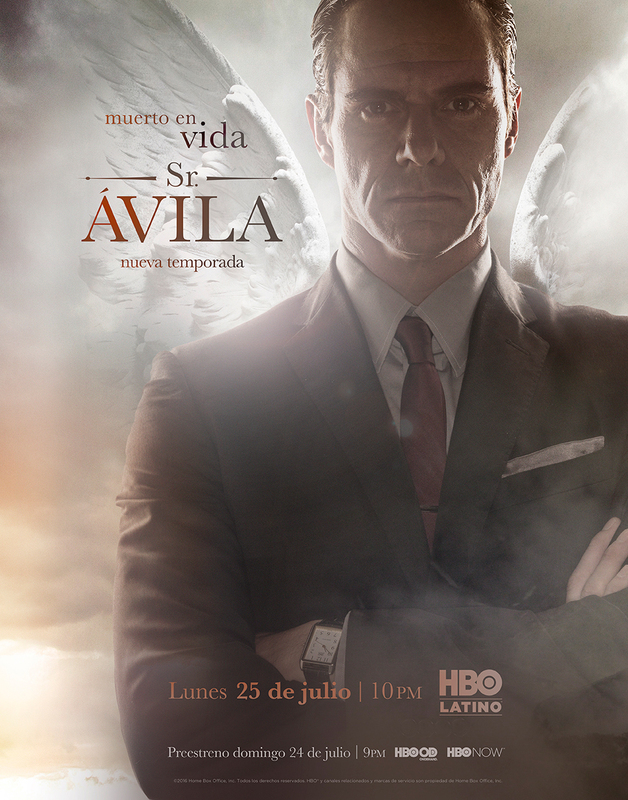 HBO Latino's "Sr. Ávila" Returns For A Third Season On July 24 With A Simultaneous Premiere On HBO NOW And HBO Latin America! NEW YORK, June 30, 2016 /PRNewswire/ -- HBO Latino will premiere the third season of the acclaimed series, Sr. Ávila, on Sunday, July 24 at 9 PM, with a real-time digital premiere on HBO NOW, HBO GO and HBO On Demand. The series will be aired on Mondays at 10 PM ET starting on July 25 on HBO Latino. The hit dramatic series, starring Tony Dalton, tells the story of the hit man Ávila and the double life he leads to deal with his personal demons. You can catch up on all seasons of Sr. Ávila on all HBO digital platforms. Season 3 consists of 10 episodes of one hour each and will return with Ávila's career on the rise as he takes on a new role as Lord of Lords, after getting rid of his predecessor--the priest who was his guide and confidant for years. When Dr. Duarte, father of the previously murdered Detective Duarte, reaches out to Ávila demanding to collaborate with him in the hopes of finding answers regarding the death of his daughter, a series of events will reveal a new plot of crime and corruption that involves undercover members of the government and the police. Soon, Sr. Ávila will realize that keeping his new job is going to be more challenging than the road that brought him there. Those close to Ávila will also have to deal with new characters this season. Iván, both his advisor and right-hand man, will now have to compete over Ávila's attention with Linares, former advisor to the Lord of Lords who now must serve Ávila. Ana, still an employee at the funeral home and accomplice to the business with Iván and Ávila, will confront her mom, Arcelia, and the secrets they keep regarding their past. As for Detective Sánchez, still recovering from the murder of his colleague, he is due to return to work with a new partner, the Vulture, with whom he shares more than likes and dislikes. HBO Latino is a dedicated Spanish-language premium channel that delivers compelling and relevant programming to the U.S. Latino market. Exclusive to the channel are the regular U.S. premieres of Spanish-language series, films and documentaries acquired from North America, Latin America, Spain and Caribbean, as well as original short-form programming. Additionally, HBO Latino offers the best Hollywood movies and HBO original programming from the network's main channel in Spanish. HBO Latino is included free with an HBO subscription. HBO Latino content can also be accessed on HBO On Demand(®), HBO GO(®) and HBO NOW(®). CINCINNATI, June 30, 2016 /PRNewswire/ -- Adam Chase is the new vice president and general manager for KERO, the Bakersfield, California, ABC-affiliated TV station of The E.W. Scripps Company (NYSE: SSP). Chase is very familiar with the market, having worked in TV and radio in Bakersfield since 2004. His hiring marks his return to KERO with a start date on July 11. For the past two years Chase was general sales manager at KGET, the NBC station in Bakersfield where he oversaw the strategy and execution of the broadcast and digital sales teams. "Adam has developed positive relationships in the Bakersfield business community and has gained tremendous leadership experience in his management roles," said Debbie Turner, vice president of station operations for Scripps. "He is ready for this new challenge to lead KERO and we are fortunate he can step into the job with so much knowledge of the market and a great understanding of what the audience wants both on the content side and sales side of the business." Chase proved his business acumen during his time at KGET, first serving as marketing specialist and then as local sales manager before his promotion to general sales manager in 2014. Chase first arrived in Bakersfield in 2004 when he worked as a marketing consultant for Clear Channel Radio. He sold local and regional advertising for six Bakersfield radio stations. He transitioned into the TV business in 2005, joining KERO as a marketing specialist when the station was owned by McGraw-Hill Broadcasting. Scripps bought the station as part of a deal to acquire a total of nine TV stations from McGraw-Hill in 2011. He serves on the board of directors for the Downtown Bakersfield Development Corporation and is on the foundation board for the Bakersfield Association of Retarded Citizens. Chase is a vocal proponent in supporting the fight against mental health disorders. He also is a member of the Bakersfield Breakfast Rotary Club. The E.W. Scripps Company (NYSE: SSP) serves audiences and businesses through a growing portfolio of television, radio and digital media brands. Scripps is one of the nation's largest independent TV station owners, with 33 television stations in 24 markets and a reach of nearly one in five U.S. households. It also owns 34 radio stations in eight markets. Scripps also runs an expanding collection of local and national digital journalism and information businesses, including multi-platform satire and humor brand Cracked, podcast industry leader Midroll Media and over-the-top video news service Newsy. Scripps also produces television shows including "THE LIST" and "The Now," runs an award-winning investigative reporting newsroom in Washington, D.C., and serves as the long-time steward of the nation's largest, most successful and longest-running educational program, the Scripps National Spelling Bee. Founded in 1878, Scripps has held for decades to the motto, "Give light and the people will find their own way." vehicle in real-time from remote locations, and helps in improved decision making. city projects in countries such as India, China, Singapore, and others. thereby driving the adoption of video analytics software and services. regions such as North America (47%), Europe (26%), APAC (16%) and Row (11%). LOS ANGELES, June 30, 2016 /PRNewswire/ -- Chaotic Good Studios, the first of its kind content company devoted to developing expansive franchises for globally recognized intellectual properties across the entertainment landscape, today announced the formation of its Franchise Lab to further the company's expansion into an original franchise content pipeline. Chaotic Good has teamed with a diverse advisory board of leading industry executives across film, television, gaming and digital to create the Chaotic Good Franchise Lab. The Chaotic Good Franchise Lab is a paid fellowship and collaborative year-long venture for established writers and content creators from diverse backgrounds to take original ideas and learn how to architect a story universe that can live across multiple platforms. Each year, the Chaotic Good Franchise Lab will result in a minimum of 25 original franchises that will encompass a range of genres. Nearly half of the projects will be family-friendly and many will also be geared towards the Chinese marketplace, where Chaotic Good Studios has done extensive work to date. Luke Ryan, Founder and Chief Executive Officer of Chaotic Good, said: "More than ever, audiences invest in specific story worlds and want to dive in as deep as they can. Every corner of media is hungry for a 'franchise,' but it is very hard to strategically design these inside of traditional entertainment systems to maximize reach and return across platforms. Understanding how to engineer expanding and sustainable entertainment franchises is key to the evolution of the creative process on every media platform. We have been fortunate to help build some incredible story worlds and content strategy for global brands, and we want to guide top creatives to do the same. We believe this is how compelling stories need to be made and creatives need to be treated in order to take storytelling to the next level." Ivan Askwith - Digital Strategist & Founder/CEO of Askwith & Co.
Jordan Levin - Chief Content Officer, NFL; Former network chief, The WB. Ben Parr - Author, Captivology; Former Editor-At-Large of Mashable; manager of Rostrum Capital; Forbes 30 under 30. Craig Titley, Franchise Lab Board Member and writer, said: "You can't build anything impactful and lasting on top of a faulty foundation. Entertainment platforms are no different. Luke Ryan and Chaotic Good understand that story is the foundation of entertainment and writers are the master craftsmen who can build it to last. By expanding the purview and impact of the storytellers, Chaotic Good can achieve what others only pay lip service to: the creation of multiple expansive and enduring franchises." Every year, the Chaotic Good Franchise Lab will select five participants and expose them to other elite writers, executives and content creators who will provide insight, advice and inspiration with the ultimate goal of developing and launching globally successful entertainment worlds that can live on multiple platforms. "We're committed to writers being treated as creators and having a hand in all aspects of their creative vision," said Ryan. "Writers are the cornerstone of these types of sophisticated projects and they're not disposable. We are lucky to have an amazing board of advisors who believe the same and are helping pave the way for the next wave of innovative storytelling." Launch of the Chaotic Good Franchise Lab and advisory board follows the recent announcement of Corey Sienega being appointed President of Development and Production and John Wikstrom joining the company as Director of Creative Affairs, signaling the company's move into boosting original content creation and to roll out an original slate in film, television, digital and emerging platforms such as virtual reality. LOS ANGELES, June 30, 2016 /PRNewswire/ -- On the heels of their own headlining tour, GRAMMY® Award-winning rock band WOLFMOTHER have been selected as one of the chosen few to open for Guns N' Roses on their historic North American 'Not In This Lifetime' stadium tour this Summer. WOLFMOTHER joins an elite list of openers including Alice In Chains, Lenny Kravitz, The Cult, Chris Stapleton for the critically acclaimed tour. WOLFMOTHER have also added additional headlining dates, an extension of their highly lauded headlining Gypsy Caravan Tour that began in February in North America before heading overseas. The band returns to the U.S. in support of their 4(th) album, VICTORIOUS (Universal Music Enterprises) which can be heard via Spotify HERE. The much-anticipated VICTORIOUSis an exhilarating demonstration of the range and depth of songwriter/vocalist/guitarist Andrew Stockdale's artistry. Recorded at Henson Studios in Los Angeles with two-time GRAMMY® winning producer Brendan O'Brien (Pearl Jam, AC/DC, Chris Cornell, Bruce Springsteen), the songs are edgy, inventive and uncompromising and rank among the band's best ever. In addition to vocals, Stockdale played guitar and bass and brought in Josh Freese (Nine Inch Nails, Bruce Springsteen, A Perfect Circle) and Joey Waronker (Air, Beck, REM) to split drum duties. Led by Stockdale, Wolfmother have amassed a global fan base, played to packed-house crowds around the world, delivered show-stealing sets at star-studded festivals like Coachella, Lollapalooza, Bonnaroo, Isle of Wight, Rock am Ring and Reading and Leeds, and have been invited to share stages with rock icons Aerosmith, AC/DC and now the highly anticipated reunion of Guns N' Roses. For their induction into the UK Music Hall of Fame, Led Zeppelin personally invited Wolfmother as their guests (the band showed their appreciation by delivering an electrifying cover of "Communication Breakdown"). Hollywood Production Company, Showreel, Is Now "Shot Glass Films"
NEW MANAGEMENT, SAME TEAM...WHAT'S YOUR STORY? LOS ANGELES, June 30, 2016 /PRNewswire/ -- Hollywood based production company, Showreel International, Inc. has re-launched as Shot Glass Films. Canadian filmmaker, Jessica Manherz, has been named Managing Partner, and the company's award-winning Director, Eric Jackson, remains as partner and lead creative force. "The switch to Shot Glass Films does not mean we are a different company. It simply means we are evolving," said Jessica Manherz. "As the landscape changes, so do the communication needs of our clients. We've developed new skills, both on the creative and production side, to help our clients connect more effectively with consumers. Now it's time to show the world what we do." With an impressive roster of work, the 31-year-old production company has mastered creating visually-stunning spots that convey relatable and compelling stories. "We've produced a lot of amazing work throughout the years, but it's our ability to tell a persuasive story through strong visuals that sets us apart," Eric Jackson commented. He added, "A strong campaign should leave a lasting impression on its audience long after they've watched it, stirring their emotions and speaking to the heart. Story is what connects consumers with people, products, services, and causes." Shot Glass Films will continue to bring story to its commercial and branded content clients and partnerships. Jessica Manherz adds, "Engaging consumers is our area of expertise, so it makes sense that commercial and branded content is the best place for us to show off our skills." Starting Shot Glass Films off strong, they have already partnered with CO2 Solutions and TITLE Boxing to create some high-quality branded spots. Stay tuned for these latest productions, which are due to be released late summer 2016. They will be available to view at www.shotglassfilms.com. Shot Glass Films is an award-winning video production company incorporated as Showreel International, Inc. on June 14, 1985 in California. Based in Hollywood, Shot Glass provides film and video production services across the United States. The company specializes in commercials, branded content, and corporate video. They have received industry recognition including an Emmy nomination, two Cine Golden Eagles, dozens of Tellys, and a 2016 ADDY. Website: www.shotglassfilms.com. ATLANTA, June 30, 2016 /PRNewswire/ -- Gray Television, Inc. ("Gray," "we," "us" or "our") (NYSE: GTN and GTN.A) today announced that its Board of Directors unanimously voted to expand the Board by one seat and elected Luis A. Garcia as a Director to fill that position. Like all Directors, Mr. Garcia's term will run through our next Annual Meeting. Luis A. Garcia is President and Lead Strategist of San Antonio-based MarketVision, an award-winning culture-inspired marketing firm focused on understanding diverse audiences and developing culturally relevant communication to bring about behavior change. The firm specializes in strategic planning, advertising content, promotions and experiential marketing, digital and social marketing, community outreach and public relations. Clients include numerous Fortune 500 companies and leading non-profit institutions. Mr. Garcia founded integrated-marketing firm Garcia 360° in 1998. He joined MarketVision as President in 2008 upon the merger of those two firms. Mr. Garcia is a native of Mexico City and a graduate of The University of Texas at Austin advertising program. Gray Chairman, President and CEO Hilton H. Howell, Jr. said, "Following the passing of our long-time Chairman Dr. Billy Mayher, the Board immediately began a process to identify an additional independent director. That effort recently culminated with the unanimous recommendation by our Nominating and Corporate Governance Committee and with the unanimous vote by the Board to elect Luis as our newest director. His entrepreneurial success and considerable experience in strategic marketing for large and small enterprises will bring further expertise and vision to our growing company." Gray Television, Inc. (NYSE: GTN and GTN.A) is a television broadcast company headquartered in Atlanta, Georgia, that owns and operates television stations and leading digital assets in markets throughout the United States. We currently own and/or operate television stations across 51 television markets that collectively broadcast over 180 program streams including 36 channels affiliated with the CBS Network, 27 channels affiliated with the NBC Network, 19 channels affiliated with the ABC Network and 14 channels affiliated with the FOX Network. We own and/or operate the number-one or number-two ranked television station operations in essentially all of our markets, which collectively cover approximately 9.5 percent of total United States television households. PHOENIX, June 30, 2016 /PRNewswire/ -- Institute for Supply Management(®) to release an ISM Report On Business(®) Brexit Report on July 1, 2016 at 11:00 a.m. ET. This report will focus on the Net Financial Impact of Brexit in 2016 on U.S. firms. This will be the first publicly available analysis of the impact of Brexit on U.S. companies based on data collected directly from U.S. firms. The ISM Report On Business(®) Brexit Report will address economic concerns in the aftermath of this historic event and the impact on factors such as trade links with the UK and EU, financial market uncertainty, global growth, currency movements and capital spending. Additionally, the report will cover expected change in labor-use patterns and manufacturing and non-manufacturing indexes. "The momentous vote for Britain to leave the EU stunned many and has ultimately caused both anguish and excitement from parties around the world. While it has left many in a state of uncertainty, I believe it is important to keep our vision focused forward. As supply management professionals, we work in the global economy and a major shift, such as Brexit, forces each of us to recalibrate our global supply strategies and trade relationships." Tom Derry, CEO, ISM. Institute for Supply Management(®) (ISM(®)) serves supply management professionals in more than 90 countries. Its 50,000 members around the world manage about $1 trillion in corporate and government supply chain procurement annually. Founded in 1915 as the first supply management institute in the world, ISM is committed to advancing the practice of supply management to drive value and competitive advantage for its members, contributing to a prosperous and sustainable world. ISM leads the profession through the ISM Report On Business(®), its highly regarded certification programs and the newly launched ISM Mastery Model(TM). This report has been issued by the association since 1931, except for a four-year interruption during World War II. MIAMI, June 30, 2016 /PRNewswire/ -- The Cannes International Festival of Creativity is a yearly celebration that recognizes the best in creative advertising worldwide. June 25(th) marked the official culmination of the festival for 2016, which reflected a historic performance for Alma. The agency won a total of 8 Lions and 18 Shortlists, establishing a new record for the multicultural industry! Alma's legendary run included awards and shortlists in the Radio category for clients Tobacco Free Florida (TFF) and The Clorox Company. More specifically, Alma received 3 Bronze Lions for TFF's "Auctioneer" and 1 Bronze Lion for "Tobacco Downs," as well as 1 Silver Lion for Clorox's "Thanks for Nothing's Big Bang" and 1 Bronze for "Gravity." Additionally, the Playdoh "Shapes" campaign received 1 Silver, and "Help Kenya Not Kanye" was awarded 1 Bronze in the Promo & Activation Category. Statistically speaking, only 8% of submissions make the Shortlist and 2.5% are awarded. "This is an amazing achievement for our agency! It's only possible when you have great clients who believe in taking smart creative risks, and it belongs to the awesome Alma team that makes our clients and our agency proud on a daily basis. We work for great ideas that generate results for our clients, and awards are the consequence. I couldn't be prouder!" said Luis Miguel Messianu, Creative Chairman and CEO of Alma. "In a world where messaging has become hyper-fragmented, where consumers are skeptical about Marketing and are inundated by heavy messaging clutter, creativity matters!" stated Isaac Mizrahi, Co-President and COO of Alma. "Award-winning ideas can only be achieved when you have a team that believes in and fights for those ideas, and especially when on the other side, there's a client who trusts the agency and believes that good creativity can make a difference for the brand and consequently for business. When these two things happen, the agency experiences a "momentum." And Alma is experiencing a momentum wherein winning prizes of this caliber is just a consequence," remarked Alvar Sunol, Co-President and Chief Creative Officer of Alma. Creatively, Alma rose to the #1 spot on the Circulo Creativo Hispanic Agency ranking, boosting the U.S. to the 4(th) place in Iberoamérica. 2016 so far has been an outstanding year for the Miami-based agency, comprised of 150 employees from over 30 nationalities. A fact that has strengthened the culture and clearly has contributed to its success with such impacting pieces. To follow Alma's work, visit AlmaAd.com or the agency's social accounts @AlmaAgency. Founded in 1994, Alma is today the 7th largest Hispanic Agency (based on Ad Age's Hispanic Fact Pack). Advertising Age listed the agency on its "A-List" in 2016, 2012 and 2010, and also highlighted Alma as the 2014 & 2015 Multicultural Agency of the Year. Last year, Creative Chairman & CEO Luis Miguel Messianu was named Legend Honoree by ADCOLOR for his career achievements in diversity, and Diversity Trendsetter at the AAF Diversity Achievement Awards in 2013. The agency has won top industry awards including: Cannes Lions, Effies, Clios, D&AD, FIAP, Art Director's Club, and El Sol. Long-standing clients include: McDonald's, State Farm, Clorox, and Tobacco Free Florida, among others. For more information, visit www.almaad.com. DALLAS, June 30, 2016 /PRNewswire/ -- We're thankful for you being our customer, and to show our gratitude, we're giving you some tokens of our appreciation. AT&T* is rewarding customers with free movie tickets through AT&T THANKS(SM) - an appreciation program that does what other carriers can't. Via att.com/tickettwosdays, the customer will simply validate their mobile number and will then be directed to movietickets.com where a coupon code for their free ticket will automatically be applied at checkout when they buy one full price ticket. The free tickets are available to qualifying customers, one per account, once a week during the length of the AT&T THANKS program--while supplies last each week. But wait--there's more. The fun doesn't stop at the movies or on Tuesdays. Soon it will be time to get musical. AT&T THANKS invites you to join AT&T and Live Nation this fall for our first presale concert offer of the year. As an AT&T post-paid wireless customer, you'll get presale access to tickets to select concerts before they are available to the general public. (3) There is no sign up and no opt in. Just another way we're showing you our appreciation for all the things you do. This year's hottest blockbusters and concerts are waiting for you. To learn more, visit att.com/attthanks. (1)Ticket Twosdays: AT&T postpaid wireless customers only (excl. employees & data-only customers). Buy one ticket for a Tuesday standard 2D movie at select theaters, get one of equal or lesser value free for the same movie. Limit one free ticket per week. Supplies of free tickets are limited; number of free tickets avail. weekly set by AT&T and may vary week to week. Check att.com/tickettwosdays for ticket avail. prior to purchase. Must complete online account validation process and consent to receive a validation code by text message. Standard text messaging and data rates may apply. Once validated will be directed to redemption site to purch. tickets. Discount automatically applied at checkout. Add'l restr's apply. Terms subj. to change. Visit att.com/attthanks for complete details. (2)AT&T cannot guarantee ticket availability for all movie titles and/or show times. (3)Live Nation Pre-Sale Access: Ticket supplies limited. Eligibility and other terms and restrictions apply. See att.com/attthanks for complete details. NEW YORK, June 30, 2016 /PRNewswire/ -- Today, Absolut® Labs unveils Absolut deadmau5 - an interactive virtual reality gaming experience created in collaboration with world renowned electronic musician deadmau5, which invites fans to join the artist on an epic night out in his own virtual world. As the latest venture from Absolut Labs, the brand's nightlife think-tank and idea incubator, Absolut deadmau5 is part of the brand's ongoing mission to redefine and reimagine nightlife through its Absolut Nights campaign. Connecting people in new and unexpected ways - both in the real world and, now, the virtual world - is in the DNA of the Absolut Nights campaign, creating nights that memories are made of. Combining live-action, motion capture and the latest videogame technology, Absolut deadmau5 puts fans in the driver seat as they guide the artist through a virtual journey from his actual studio, navigating various obstacles and surprises, before culminating in a live performance of his exclusive new track, "Saved." "Absolut has always pushed the boundaries of creative collaborations, from Andy Warhol to Lady Gaga, to foster unique connections between artists and fans," said Afdhel Aziz, Director, Absolut Labs. "With Absolut deadmau5, we're continuing our ongoing exploration of nightlife, using virtual reality as a canvas to create an epic, cinematic journey that celebrates spontaneous, adventurous nights out - that you can experience anytime, anywhere, anyplace." Fans who pre-order the exclusive Limited Edition Absolut deadmau5 VR cardboard headset at Absolutdeadmau5.com, which was designed in collaboration with the artist, will be the first to best experience the Absolut deadmau5 app and hear the new deadmau5 track on July 27(th). "It's no secret I'm a huge gamer. Video games have always played a major role in my life," says electronic music producer deadmau5. "I couldn't pass up the opportunity to create my own VR gaming experience, especially when it meant I could bring a broad set of fans on an interactive journey alongside me and share my music with them in a whole new way." The Absolut deadmau5 experience begins in the artist's garage with a guest appearance from his Instagram-famous cat, Meowingtons. Here, users help deadmau5 find his car, complete with a driver, and set out on a journey toward a nighttime gig. For the next scenes, users maneuver past obstacles ranging from skeptical bouncers to selfie-taking fans to get deadmau5 to his concert destination on time. The culmination of the experience is a concert in which the artist performs his new track, "Saved" in front of a live audience shot in the artist's hometown of Toronto. Absolut deadmau5 is the second VR project to come out of Absolut Labs, an experimental and creative venture dedicated to creating inclusive and innovative experiences that help shape the future of nightlife. Absolut Labs first experimented with bridging music and virtual reality in July 2015 with Absolut Reality x Bob Moses, the world's first live VR concert. Fans across the U.S. were given front row access to a sold-out Bob Moses concert from Brooklyn, New York via 360(o) live virtual reality video. The Absolut deadmau5 app will be available for download in all major app stores, including iOS, Android and Samsung, and is best experienced using the Limited Edition Absolut deadmau5 VR cardboard headsets - available for pre-order starting today, for $17.95, at Absolutdeadmau5.com. The company's leading spirits and wines include such prestigious brands as Absolut® Vodka, Chivas Regal® Scotch Whisky, The Glenlivet® Single Malt Scotch Whisky, Jameson® Irish Whiskey, Malibu®, Kahlúa® Liqueur, Beefeater® Gin, Plymouth(TM) Gin, Seagram's Extra Dry Gin®, Martell® Cognac, Hiram Walker® Liqueurs, Pernod®, Ricard® and Avión(TM) Tequila; such superior wines as Jacob's Creek®, Kenwood® Vineyards and Brancott Estate®; and such exquisite champagnes and sparkling wines as Perrier-Jouët® Champagne, G.H. Mumm(TM) Champagne and Mumm Napa® sparkling wines. Joel Zimmerman, more commonly known as deadmau5 (pronounced 'dead mouse'), is one of the world's most respected electronic music producers of modern times. Enjoying international chart success with his singles "Professional Griefers," "Sofi Needs A Ladder," "Ghosts 'n' Stuff" and "I Remember," he has also released five critically acclaimed albums: > album title goes here < (which reached #1 on the Billboard Dance/Electronic Chart, #2 on the Billboard Independent Album Chart and #5 on the Billboard Digital Album Chart), 4×4=12 (recently recognized for having sold over 500,000 copies in the United States), For Lack Of A Better Name, Random Album Title and while(1<2). The multiple JUNO Award-winning and GRAMMY®-nominated artist performed at the 54th Annual GRAMMY Awards as part of its first ever telecast performance highlighting electronic music. He appeared on the cover of Rolling Stone (summer double issue, 2012), marking him as the first electronic artist to do so. His ability to push the boundaries of his talent grows at an equal rate to his fan base, which counts over nine million on his Facebook page. Look for new music and more exciting things to come from deadmau5 in 2016. From countless individual moments and stories, one film will be crafted by director Trish Dolman (Eco-Pirate: The Story of Paul Watson; LUNA: SPIRIT OF THE WHALE) to capture Canada on a single day - engaging people across the country, and Canadians around the world, to share - in any language - their hopes and fears, their personal stories and, in doing so, what it means to be Canadian. From the ordinary to the extraordinary, footage submitted may be included in the final film project set to air on CTV or featured on the film's online archive at CanadaInADay.ca. landed immigrants across the country, or Canadians living abroad. the 24-hour period on Saturday, September 10, 2016.
their footage online at CanadaInADay.ca. filming themselves and the people or places that mean the most to them. -- What do you love? -- What do you fear? -- What do you hope for? -- What does Canada mean to you? showcase their answers with a visual response. For more information, including video submission requirements and tips from director Trish Dolman on how to create a great video, people are encouraged to visit CanadaInADay.ca. Canadians can also sign up to receive alerts and updates as the countdown to the Saturday, Sept. 10 film day. Celebrity ambassadors supporting the project and helping to bring awareness to the CANADA IN A DAYSaturday, Sept. 10 film day include Russell Peters, Shawn Ashmore, Karine Vanasse, Rick Hansen, Jacob Tremblay, Patrice Bernier, Jason Priestley, Tessa Virtue, Scott Moir, Benjamin Hollingsworth, Giacomo Gianniotti, Jessica Lucas, Roger Frappier, Chan Hon Goh, and more. CANADA IN A DAY is inspired by the original award-winning Ridley Scott film, Life in a Day. Shot in 2010 and released in 2011, Life in a Day was the remarkable story of one day on Earth. The project garnered more than 80,000 submissions around the world, and contained more than 4,500 hours of deeply personal, powerful moments shot by contributors from Australia to Zambia - from the heart of bustling major cities to some of the most remote places on Earth. Since then, several countries have launched their own In a Day films, including Britain, Italy, Germany, Spain, India, and Japan. CANADA IN A DAY is produced by Screen Siren Pictures Inc. in association with CTV, with the financial participation of the Canada Media Fund, Bell Fund, Creative BC, FIBC, and the Government of Canada. Executive producers are Scott Free Films, Trish Dolman, and Christine Haebler, with Trish Dolman and Michael Ghent producing for Screen Siren Pictures Inc. Switch United is the web producer and Innovate by Day is the Social Media producer. For Bell Media, Robin Johnston is Director, Factual and Reality, Independent Production, and Corrie Coe is Senior Vice-President, Independent Production. Mike Cosentino is Senior Vice-President, Programming, CTV Networks and CraveTV. Randy Lennox is President, Entertainment Production and Broadcasting, Bell Media. Established in 1997, Screen Siren Pictures is a leading independent film, television and digital media production company based in Vancouver, BC. We create innovative, award-winning feature films, documentaries and television. With a focus on international co-productions and partnerships, we bring creative energy and established local and international industry relationships to all projects. President and founder Trish Dolman has been working in film and television for more than twenty years as an award-winning producer and a documentary director. In April of 2009 she joined forces with feature film veteran Christine Haebler as a producing partner. Known for excellence in production quality and fiscal management, Screen Siren has more than twenty productions to its credit and has produced for leading broadcasters around the world with completed titles premiering and winning awards at the major film festivals. Notable titles include Hector and the Search for Happiness starring Simon Pegg, Rosamund Pike, Toni Collette, Jean Reno and Christopher Plummer, as well as recent documentaries such as Eco-Pirate: The Story of Paul Watson. Bell Media has commissioned some of Canada's most-watched and most-acclaimed original programming, working with the best Canadian independent producers in the country. Hit series commissioned by CTV include ratings success stories SAVING HOPE, MOTIVE, the record-breaking THE AMAZING RACE CANADA, and MASTERCHEF CANADA. Upcoming original series on CTV include CARDINAL and THE DISAPPEARANCE. Among the original scripted series on Bell Media pay, specialty, and streaming platforms are the internationally acclaimed ORPHAN BLACK, Space's most-watched original series KILLJOYS, Bravo's award-winning and most-watched original drama 19-2, award-winning dramedy SENSITIVE SKIN, CraveTV's original series LETTERKENNY and RUSSELL PETERS IS THE INDIAN DETECTIVE, Discovery's upcoming drama FRONTIER, and Comedy's new satirical news series THE BEAVERTON. Discovery is also home to Bell Media's hit factual series HIGHWAY THRU HELL, COLD WATER COWBOYS, and CANADA'S WORST DRIVER, among others. Bell Media is one of the first media companies in North America to commit to producing all new scripted series in 4K.